Abstract: Respiratory system diseases are common and major ailments that seriously endanger human health. Resveratrol, a polyphenolic phytoalexin, is considered an anti-inflammatory, antioxidant, and anticancer agent. Thanks to its wide range of biological activities, resveratrol has become a hotspot in many fields, including respiratory system diseases. Indeed, research has demonstrated that resveratrol is helpful to relieve pulmonary function in the general population. Meanwhile, growing evidence indicates that resveratrol plays a protective role in respiratory system diseases. This review aimed to summarize the main protective effects of resveratrol in respiratory system diseases, including its anti-inflammatory, antiapoptotic, antioxidant, antifibrotic, antihypertensive, and anticancer activities. We found that resveratrol plays a protective role in the respiratory system through a variety of mechanisms, and so it may become a new drug for the treatment of respiratory system diseases. Resveratrol (3,5,4′-trihydroxy-trans-stilbene) is a polyphenolic compound found in multiple plant species, including grapes and peanuts. Its chemical structure comprises two aromatic rings connected by a methylene bridge; there are two isomeric forms, cis and trans isomers, of which the trans variant displays biological activities.1 Resveratrol was first identified by Takaoka in Veratrum grandiflorum roots in 1939.2 Later on, it was described as the “French paradox” in 1992, based on the notion that due to red wine consumption, the risk of cardiovascular disease in French individuals is lower than that of other Europeans despite the high intake of saturated fats.2,3 In addition to alcohol, red wine contains many polyphenols, including resveratrol.4 Multiple studies, including in vitro and animal experiments, have confirmed that resveratrol has protective effects on multiple tissues and organs.5–7 This study reviews the potential effects of resveratrol in respiratory system diseases, from the aspects of inflammation, apoptosis, oxidation, fibrosis, pulmonary hypertension, and cancer, describing evidences for related molecular mechanisms (Figure 1). 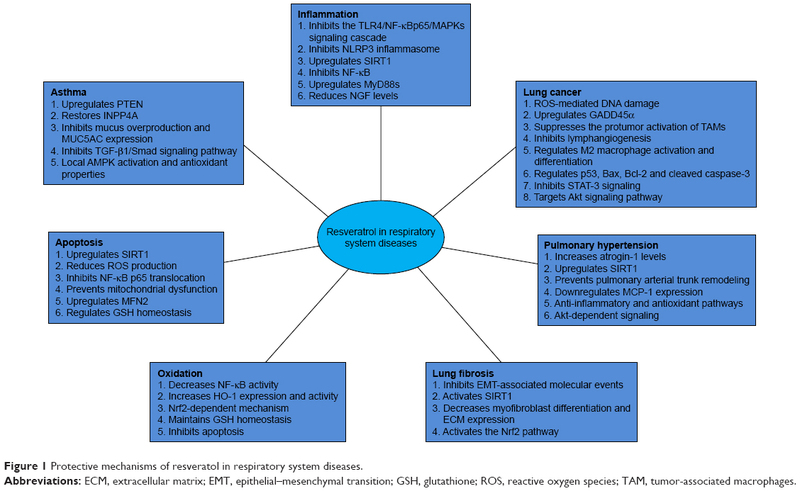 Figure 1 Protective mechanisms of resveratol in respiratory system diseases. Abbreviations: ECM, extracellular matrix; EMT, epithelial–mesenchymal transition; GSH, glutathione; ROS, reactive oxygen species; TAM, tumor-associated macrophages. In addition to protective effects on the respiratory system, resveratrol also protects against cardiovascular diseases, platelet aggregation, diabetes, and neurodegenerative diseases. The “French paradox” indicates that French individuals have lower incidence of cardiovascular diseases, which raises the question about the amount of wine one should drink to stay healthy. In vitro studies have shown that 111 glasses of wine should be consumed daily to achieve a baseline dose.98 Despite the benefits of resveratrol in human health, its application in food and pharmaceutical industries is limited for a variety of reasons, including low bioavailability, water solubility, and chemical stability; indeed, this molecule is rapidly and extensively decomposed and excreted.99–101 Indeed, the water solubility of resveratrol is too low without emulsifiers or stabilizers to produce the desired concentrations of aqueous solution.99 Resveratrol is a highly light-sensitive compound, and exposure to light causes about 80%–90% of trans-resveratrol in solution to convert into cis-resveratrol.102 Resveratrol is also easily degraded at high temperature, as well as under pH change, ambient fluorescent light, or air exposure.101,103 Two clinical trials have assessed the absorption and bioavailability of resveratrol, using a single 25 mg oral dose, which is equivalent to a moderate intake of red wine.100,104 Despite the use of highly sensitive analytical methods and specific molecules, circulating plasma resveratrol was barely detectable. The low bioavailability of resveratrol is largely due to extensive metabolism in the gut and liver.105 Meanwhile, in most studies, resveratrol is used in the free form, which is not suitable for drug delivery.106 In recent years, various attempts have been made to improve the oral bioavailability of resveratrol, including complexation with β-cyclodextrins or hydroxypropyl-β-cyclodextrins,107 solid dispersion,108 liposomes,109 and lipid or polymeric nanoparticles.106,110 Despite important advances, these technologies still face limitations, primarily with the use of large amounts of excipients and insufficient relevant bioavailability data. Therefore, new formulations may be a way to improve resveratrol’s bioavailability and target specific organs. The protective effects of resveratrol in respiratory system diseases were discussed in terms of anti-inflammatory, antiapoptotic, antioxidant, antifibrotic, antihypertensive, and antitumor properties, demonstrating a great potential for resveratrol in the treatment of respiratory system diseases. So far, only few clinical studies have analyzed the effects of resveratrol, including only a few patients. In addition, existing studies have focused on rodent models, with little efforts invested in animals closely related to humans, such as pigs and nonhuman primates. Therefore, future research should shift the focus to large animals and gradually transfer to clinical trials, while improving the stability and bioavailability of resveratrol. Such studies would provide a strong basis for the use of resveratrol, which has great therapeutic potential. This work was supported by the National Natural Science Foundation of China (No 81571480 to Wen-bin Dong). Oyenihi OR, Oyenihi AB, Adeyanju AA, Oguntibeju OO. Antidiabetic effects of resveratrol: the way forward in its clinical utility. J Diabetes Res. 2016;2016:9737483. Catalgol B, Batirel S, Taga Y, Ozer NK. Resveratrol: French paradox revisited. Front Pharmacol. 2012;3:141. Renaud S, de Lorgeril M. Wine, alcohol, platelets, and the French paradox for coronary heart disease. Lancet. 1992;339(8808):1523–1526. Cho S, Namkoong K, Shin M, et al. Cardiovascular protective effects and clinical applications of resveratrol. J Med Food. 2017;20(4):323–334. Vella RK, Pullen C, Coulson FR, Fenning AS. Resveratrol prevents cardiovascular complications in the SHR/STZ rat by reductions in oxidative stress and inflammation. BioMed Res Int. 2015;2015:918123. Sadi G, Pektas MB, Koca HB, Tosun M, Koca T. Resveratrol improves hepatic insulin signaling and reduces the inflammatory response in streptozotocin-induced diabetes. Gene. 2015;570(2):213–220. Zhang H, Sun Q, Xu T, et al. Resveratrol attenuates the progress of liver fibrosis via the Akt/nuclear factor-kappaB pathways. Mol Med Rep. 2016;13(1):224–230. Ma Y, Bao Y, Wang S, et al. Anti-inflammation effects and potential mechanism of saikosaponins by regulating nicotinate and nicotinamide metabolism and arachidonic acid metabolism. Inflammation. 2016;39(4):1453–1461. Arimura K, Aoshiba K, Tsuji T, Tamaoki J. Chronic low-grade systemic inflammation causes DNA damage in the lungs of mice. Lung. 2012;190(6):613–620. Yang R, Yang L, Shen X, et al. Suppression of NF-kappaB pathway by crocetin contributes to attenuation of lipopolysaccharide-induced acute lung injury in mice. Eur J Pharmacol. 2012;674(2–3):391–396. Wang J, Liu YT, Xiao L, Zhu L, Wang Q, Yan T. Anti-inflammatory effects of apigenin in lipopolysaccharide-induced inflammatory in acute lung injury by suppressing COX-2 and NF-kB pathway. Inflammation. 2014;37(6):2085–2090. Deng Z, Jin J, Wang Z, Wang Y, Gao Q, Zhao J. The metal nanoparticle-induced inflammatory response is regulated by SIRT1 through NF-kappaB deacetylation in aseptic loosening. Int J Nanomed. 2017;12:3617–3636. Wang G, Hu Z, Fu Q, et al. Resveratrol mitigates lipopolysaccharide-mediated acute inflammation in rats by inhibiting the TLR4/NF-kappaBp65/MAPKs signaling cascade. Sci Rep. 2017;7:45006. Jiang L, Zhang L, Kang K, et al. Resveratrol ameliorates LPS-induced acute lung injury via NLRP3 inflammasome modulation. Biomed Pharmacother. 2016;84:130–138. Ma L, Zhao Y, Wang R, et al. 3,5,4′-Tri-O-acetylresveratrol attenuates lipopolysaccharide-induced acute respiratory distress syndrome via MAPK/SIRT1 pathway. Mediators Inflamm. 2015;2015:143074. Liu J, Yi L, Xiang Z, Zhong J, Zhang H, Sun T. Resveratrol attenuates spinal cord injury-induced inflammatory damage in rat lungs. Int J Clin Exp Pathol. 2015;8(2):1237–1246. Andrews CS, Matsuyama S, Lee BC, Li JD. Resveratrol suppresses NTHi-induced inflammation via up-regulation of the negative regulator MyD88 short. Sci Rep. 2016;6:34445. Zang N, Li S, Li W, et al. Resveratrol suppresses persistent airway inflammation and hyperresponsivess might partially via nerve growth factor in respiratory syncytial virus-infected mice. Int Immunopharmacol. 2015;28(1):121–128. Rieder SA, Nagarkatti P, Nagarkatti M. Multiple anti-inflammatory pathways triggered by resveratrol lead to amelioration of staphylococcal enterotoxin B-induced lung injury. Br J Pharmacol. 2012;167(6):1244–1258. Xu W, Zhao Y, Zhang B, et al. Resveratrol attenuates hyperoxia-induced oxidative stress, inflammation and fibrosis and suppresses Wnt/β-catenin signalling in lungs of neonatal rats. Clin Exp Pharmacol Physiol. 2015;42(10):1075–1083. Liu PL, Chong IW, Lee YC, et al. Anti-inflammatory effects of resveratrol on hypoxia/reoxygenation-induced alveolar epithelial cell dysfunction. J Agric Food Chem. 2015;63(43):9480–9487. Chen G, Tang J, Ni Z, et al. Antiasthmatic effects of resveratrol in ovalbumin-induced asthma model mice involved in the upregulation of PTEN. Biol Pharm Bull. 2015;38(4):507–513. Aich J, Mabalirajan U, Ahmad T, et al. Resveratrol attenuates experimental allergic asthma in mice by restoring inositol polyphosphate 4 phosphatase (INPP4A). Int Immunopharmacol. 2012;14(4):438–443. Ni ZH, Tang JH, Chen G, et al. Resveratrol inhibits mucus overproduction and MUC5AC expression in a murine model of asthma. Mol Med Rep. 2016;13(1):287–294. Lee HY, Kim IK, Yoon HK, Kwon SS, Rhee CK, Lee SY. Inhibitory effects of resveratrol on airway remodeling by transforming growth factor-beta/Smad signaling pathway in chronic asthma model. Allergy Asthma Immunol Res. 2017;9(1):25–34. Chen J, Zhou H, Wang J, et al. Therapeutic effects of resveratrol in a mouse model of HDM-induced allergic asthma. Int Immunopharmacol. 2015;25(1):43–48. Andre DM, Calixto MC, Sollon C, et al. Therapy with resveratrol attenuates obesity-associated allergic airway inflammation in mice. Int Immunopharmacol. 2016;38:298–305. Johnson A, DiPietro LA. Apoptosis and angiogenesis: an evolving mechanism for fibrosis. FASEB J. 2013;27(10):3893–3901. Galani V, Tatsaki E, Bai M, et al. The role of apoptosis in the pathophysiology of Acute Respiratory Distress Syndrome (ARDS): an up-to-date cell-specific review. Pathol Res Pract. 2010;206(3):145–150. Walsh GM. Eosinophil apoptosis and clearance in asthma. J Cell Death. 2013;6:17–25. Liu G, Pei F, Yang F, et al. Role of autophagy and apoptosis in non-small-cell lung cancer. Int J Mol Sci. 2017;18(2):367. Hori YS, Kuno A, Hosoda R, Horio Y. Regulation of FOXOs and p53 by SIRT1 modulators under oxidative stress. PLoS One. 2013;8(9):e73875. Horio Y, Hayashi T, Kuno A, Kunimoto R. Cellular and molecular effects of sirtuins in health and disease. Clin Sci. 2011;121(5):191–203. Zhang C, Li Q, Kang L, et al. [Resveratrol inhibits hyperxia-induced cell apoptosis through up-regulating SIRT1 expression in HPAECs]. Xi Bao Yu Fen Zi Mian Yi Xue Za Zhi. 2015;31(5):590–595. Zhao G, Li S, Hong G, et al. The effect of resveratrol on paraquat-induced acute lung injury in mice and its mechanism. Zhonghua Wei Zhong Bing Ji Jiu Yi Xue. 2016;28(1):33–37. Li Y, Luo B, Zhang L, Ma M, Guo X. Resveratrol attenuates endoplasmic reticulum stress and alveolar epithelial apoptosis in a rat model of chronic obstructive pulmonary disease. Zhonghua Jie He He Hu Xi Za Zhi. 2014;37(1):30–35. Song C, Luo B, Gong L. Resveratrol reduces the apoptosis induced by cigarette smoke extract by upregulating MFN2. PLoS One. 2017;12(4):e0175009. Xuan LL, Shi J, Yao CS, et al. Vam3, a resveratrol dimer, inhibits cigarette smoke-induced cell apoptosis in lungs by improving mitochondrial function. Acta Pharmacol Sinica. 2014;35(6):779–791. Chen C, Jiang X, Hu Y, Zhang Z. The protective role of resveratrol in the sodium arsenite-induced oxidative damage via modulation of intracellular GSH homeostasis. Biol Trace Element Res. 2013;155(1):119–131. Sha H, Ma Q, Jha RK, Wang Z. Resveratrol ameliorates lung injury via inhibition of apoptosis in rats with severe acute pancreatitis. Exp Lung Res. 2009;35(4):344–358. Xia L, Ding F, Zhu JH, Fu GS. Resveratrol attenuates apoptosis of pulmonary microvascular endothelial cells induced by high shear stress and proinflammatory factors. Human Cell. 2011;24(3):127–133. Sarma JV, Ward PA. Oxidants and redox signaling in acute lung injury. Compr Physiol. 2011;1(3):1365–1381. Ozdemir OM, Gozkeser E, Bir F, Yenisey C. The effects of resveratrol on hyperoxia-induced lung injury in neonatal rats. Pediatr Neonatol. 2014;55(5):352–357. Liu H, Ren J, Chen H, et al. Resveratrol protects against cigarette smoke-induced oxidative damage and pulmonary inflammation. J Biochem Mol Toxicol. 2014;28(10):465–471. Cerqueira AM, Khaper N, Lees SJ, Ulanova M. The antioxidant resveratrol down-regulates inflammation in an in-vitro model of Pseudomonas aeruginosa infection of lung epithelial cells. Canadian J Physiol Pharmacol. 2013;91(3):248–255. Zahlten J, Kim YJ, Doehn JM, et al. Streptococcus pneumoniae-induced oxidative stress in lung epithelial cells depends on pneumococcal autolysis and is reversible by resveratrol. J Infect Dis. 2015;211(11):1822–1830. Zhang HX, Duan GL, Wang CN, Zhang YQ, Zhu XY, Liu YJ. Protective effect of resveratrol against endotoxemia-induced lung injury involves the reduction of oxidative/nitrative stress. Pulm Pharmacol Ther. 2014;27(2):150–155. Zhang YQ, Liu YJ, Mao YF, Dong WW, Zhu XY, Jiang L. Resveratrol ameliorates lipopolysaccharide-induced epithelial mesenchymal transition and pulmonary fibrosis through suppression of oxidative stress and transforming growth factor-beta1 signaling. Clin Nutr. 2015;34(4):752–760. Ogawa EN, Ishizaka A, Tasaka S, et al. Contribution of high-mobility group box-1 to the development of ventilator-induced lung injury. Am J Respir Crit Care Med. 2006;174(4):400–407. Dong WW, Liu YJ, Lv Z, et al. Lung endothelial barrier protection by resveratrol involves inhibition of HMGB1 release and HMGB1-induced mitochondrial oxidative damage via an Nrf2-dependent mechanism. Free Radical Biol Med. 2015;88(Pt B):404–416. Trotta V, Lee WH, Loo CY, Young PM, Traini D, Scalia S. Co-spray dried resveratrol and budesonide inhalation formulation for reducing inflammation and oxidative stress in rat alveolar macrophages. Eur J Pharmaceut Sci. 2016;86:20–28. Chen C, Jiang X, Lai Y, Liu Y, Zhang Z. Resveratrol protects against arsenic trioxide-induced oxidative damage through maintenance of glutathione homeostasis and inhibition of apoptotic progression. Environ Mol Mutagen. 2015;56(3):333–346. Lee YJ, Kim MJ, Yoon YS, Choi YH, Kim HS, Kang JL. Simvastatin treatment boosts benefits of apoptotic cell infusion in murine lung fibrosis. Cell Death Dis. 2017;8(6):e2860. Du B, Shim JS. targeting epithelial-mesenchymal transition (EMT) to overcome drug resistance in cancer. Molecules. 2016;21(7):965. Abidi A, Robbe A, Kourda N, Ben Khamsa S, Legrand A. Nigella sativa, a traditional Tunisian herbal medicine, attenuates bleomycin-induced pulmonary fibrosis in a rat model. Biomed Pharmacother. 2017;90:626–637. Mouratis MA, Aidinis V. Modeling pulmonary fibrosis with bleomycin. Curr Opin Pulm Med. 2011;17(5):355–361. Natalin HM, Garcia AF, Ramalho LN, Restini CB. Resveratrol improves vasoprotective effects of captopril on aortic remodeling and fibrosis triggered by renovascular hypertension. Cardiovasc Pathol. 2016;25(2):116–119. He T, Xiong J, Nie L, et al. Resveratrol inhibits renal interstitial fibrosis in diabetic nephropathy by regulating AMPK/NOX4/ROS pathway. J Mol Med. 2016;94(12):1359–1371. Rong L, Wu J, Wang W, Zhao RP, Xu XW, Hu D. Sirt 1 activator attenuates the bleomycin-induced lung fibrosis in mice via inhibiting epithelial-to-mesenchymal transition (EMT). Eur Rev Med Pharmacol Sci. 2016;20(10):2144–2150. Impellizzeri D, Talero E, Siracusa R, et al. Protective effect of polyphenols in an inflammatory process associated with experimental pulmonary fibrosis in mice. Br J Nutr. 2015;114(6):853–865. Akgedik R, Akgedik S, Karamanli H, et al. Effect of resveratrol on treatment of bleomycin-induced pulmonary fibrosis in rats. Inflammation. 2012;35(5):1732–1741. Zeng Z, Cheng S, Chen H, et al. Activation and overexpression of Sirt1 attenuates lung fibrosis via P300. Biochem Biophys Res Commun. 2017;486(4):1021–1026. He X, Wang L, Szklarz G, Bi Y, Ma Q. Resveratrol inhibits paraquat-induced oxidative stress and fibrogenic response by activating the nuclear factor erythroid 2-related factor 2 pathway. J Pharmacol Exp Ther. 2012;342(1):81–90. Chen D, Gao W, Wang S, Ni B, Gao Y. Critical effects of epigenetic regulation in pulmonary arterial hypertension. Cell Mol Life Sci. Epub 2017 Jun 1. Boucherat O, Vitry G, Trinh I, Paulin R, Provencher S, Bonnet S. The cancer theory of pulmonary arterial hypertension. Pulm Circ. 2017;7(2):285–299. Nogueira-Ferreira R, Vitorino R, Ferreira R, Henriques-Coelho T. Exploring the monocrotaline animal model for the study of pulmonary arterial hypertension: a network approach. Pulm Pharmacol Ther. 2015;35:8–16. Paffett ML, Lucas SN, Campen MJ. Resveratrol reverses monocrotaline-induced pulmonary vascular and cardiac dysfunction: a potential role for atrogin-1 in smooth muscle. Vasc Pharmacol. 2012;56(1–2):64–73. Zhou S, Li MT, Jia YY, et al. Regulation of cell cycle regulators by SIRT1 contributes to resveratrol-mediated prevention of pulmonary arterial hypertension. BioMed Res Int. 2015;2015:762349. Wilson DN, Schacht SE, Al-Nakkash L, Babu JR, Broderick TL. Resveratrol prevents pulmonary trunk remodeling but not right ventricular hypertrophy in monocrotaline-induced pulmonary hypertension. Pathophysiology. 2016;23(4):243–250. Yang DL, Zhang HG, Xu YL, et al. Resveratrol inhibits right ventricular hypertrophy induced by monocrotaline in rats. Clin Exp Pharmacol Physiol. 2010;37(2):150–155. Chun C, Yang W, Xueding C, et al. Resveratrol downregulates acute pulmonary thromboembolism-induced pulmonary artery hypertension via p38 mitogen-activated protein kinase and monocyte chemoattractant protein-1 signaling in rats. Life Sci. 2012;90(19–20):721–727. Luo Y, Zhang B, Dong HY, et al. Prevention of hypoxic pulmonary hypertension by hypoxia-inducible expression of p27 in pulmonary artery smooth muscle cells. Gene Ther. 2014;21(8):751–758. Xu D, Li Y, Zhang B, et al. Resveratrol alleviate hypoxic pulmonary hypertension via anti-inflammation and anti-oxidant pathways in rats. Int J Med Sci. 2016;13(12):942–954. Chen B, Xue J, Meng X, Slutzky JL, Calvert AE, Chicoine LG. Resveratrol prevents hypoxia-induced arginase II expression and proliferation of human pulmonary artery smooth muscle cells via Akt-dependent signaling. Am J Physiol Lung Cell Mol Physiol. 2014;307(4):L317–L325. Yu L, Tu Y, Jia X, et al. Resveratrol protects against pulmonary arterial hypertension in rats via activation of silent information regulator 1. Cell Physiol Biochem. 2017;42(1):55–67. Liu B, Luo XJ, Yang ZB, et al. Inhibition of NOX/VPO1 pathway and inflammatory reaction by trimethoxystilbene in prevention of cardiovascular remodeling in hypoxia-induced pulmonary hypertensive rats. J Cardiovasc Pharmacol. 2014;63(6):567–576. Gao G, Wang X, Qin X, et al. Effects of trimethoxystilbene on proliferation and apoptosis of pulmonary artery smooth muscle cells. Cell Biochem Biophys. 2012;64(2):101–106. Ko JC, Syu JJ, Chen JC, et al. Resveratrol enhances etoposide-induced cytotoxicity through down-regulating ERK1/2 and AKT-mediated X-ray repair cross-complement group 1 (XRCC1) protein expression in human non-small-cell lung cancer cells. Basic Clin Pharmacol Toxicol. 2015;117(6):383–391. Lucas IK, Kolodziej H. Trans-resveratrol induces apoptosis through ROS-triggered mitochondria-dependent pathways in A549 human lung adenocarcinoma epithelial cells. Planta Med. 2015;81(12–13):1038–1044. Shi Q, Geldenhuys W, Sutariya V, Bishayee A, Patel I, Bhatia D. CArG-driven GADD45alpha activated by resveratrol inhibits lung cancer cells. Genes Cancer. 2015;6(5–6):220–230. Sun L, Chen B, Jiang R, Li J, Wang B. Resveratrol inhibits lung cancer growth by suppressing M2-like polarization of tumor associated macrophages. Cell Immunol. 2017;311:86–93. Kimura Y, Sumiyoshi M. Resveratrol prevents tumor growth and metastasis by inhibiting lymphangiogenesis and M2 macrophage activation and differentiation in tumor-associated macrophages. Nutr Cancer. 2016;68(4):667–678. Wang X, Wang D, Zhao Y. Effect and mechanism of resveratrol on the apoptosis of lung adenocarcinoma cell line A549. Cell Biochem Biophys. 2015;73(2):527–531. Yin HT, Tian QZ, Guan L, Zhou Y, Huang XE, Zhang H. In vitro and in vivo evaluation of the antitumor efficiency of resveratrol against lung cancer. Asian Pac J Cancer Prev. 2013;14(3):1703–1706. Li X, Wang D, Zhao QC, Shi T, Chen J. Resveratrol inhibited non-small cell lung cancer through inhibiting STAT-3 signaling. Am J Med Sci. 2016;352(5):524–530. Li W, Ma X, Li N, et al. Resveratrol inhibits Hexokinases II mediated glycolysis in non-small cell lung cancer via targeting Akt signaling pathway. Exp Cell Res. 2016;349(2):320–327. Zhang L, Dai F, Sheng PL, Chen ZQ, Xu QP, Guo YQ. Resveratrol analogue 3,4,4′-trihydroxy-trans-stilbene induces apoptosis and autophagy in human non-small-cell lung cancer cells in vitro. Acta Pharmacol Sinica. 2015;36(10):1256–1265. Bai T, Dong DS, Pei L. Synergistic antitumor activity of resveratrol and miR-200c in human lung cancer. Oncol Rep. 2014;31:2293–2297. Yang Q, Xu E, Dai J, et al. A novel long noncoding RNA AK001796 acts as an oncogene and is involved in cell growth inhibition by resveratrol in lung cancer. Toxicol Appl Pharmacol. 2015;285(2):79–88. Bae S, Lee EM, Cha HJ, et al. Resveratrol alters microRNA expression profiles in A549 human non-small cell lung cancer cells. Mol Cells. 2011;32(3):243–249. Zhu Y, He W, Gao X, et al. Resveratrol overcomes gefitinib resistance by increasing the intracellular gefitinib concentration and triggering apoptosis, autophagy and senescence in PC9/G NSCLC cells. Sci Rep. 2015;5(1):17730. Hu S, Li X, Xu R, et al. The synergistic effect of resveratrol in combination with cisplatin on apoptosis via modulating autophagy in A549 cells. Acta Biochim Biophys Sinica. 2016;48(6):528–535. Gu S, Chen C, Jiang X, Zhang Z. ROS-mediated endoplasmic reticulum stress and mitochondrial dysfunction underlie apoptosis induced by resveratrol and arsenic trioxide in A549 cells. Chem Biol Interact. 2016;245:100–109. Gu S, Chen C, Jiang X, Zhang Z. Resveratrol synergistically triggers apoptotic cell death with arsenic trioxide via oxidative stress in human lung adenocarcinoma A549 cells. Biol Trace Elem Res. 2014;163(1–2):112–123. Nie P, Hu W, Zhang T, Yang Y, Hou B, Zou Z. Synergistic induction of erlotinib-mediated apoptosis by resveratrol in human non-small-cell lung cancer cells by down-regulating survivin and up-regulating PUMA. Cell Physiol Biochem. 2015;35(6):2255–2271. Lachenmeier DW, Godelmann R, Witt B, Riedel K, Rehm J. Can resveratrol in wine protect against the carcinogenicity of ethanol? A probabilistic dose-response assessment. Int J Cancer. 2014;134(1):144–153. Wan ZL, Wang JM, Wang LY, Yuan Y, Yang XQ. Complexation of resveratrol with soy protein and its improvement on oxidative stability of corn oil/water emulsions. Food Chem. 2014;161:324–331. Walle T. High absorption but very low bioavailability of oral resveratrol in humans. Drug Metab Dispos. 2004;32(12):1377–1382. Delmas D, Aires V, Limagne E, et al. Transport, stability, and biological activity of resveratrol. Ann NY Acad Sci. 2011;1215(1):48–59. Vian MA, Tomao V, Gallet S, Coulomb PO, Lacombe JM. Simple and rapid method for cis- and trans-resveratrol and piceid isomers determination in wine by high-performance liquid chromatography using Chromolith columns. J Chromatogr A. 2005;1085(2):224–229. Zupančič Š, Lavrič Z, Kristl J. Stability and solubility of trans-resveratrol are strongly influenced by pH and temperature. Eur J Pharm Biopharm. 2015;93:196–204. Goldberg DM, Yan J, Soleas GJ. Absorption of three wine-related polyphenols in three different matrices by healthy subjects. Clin Biochem. 2003;36(1):79–87. Francioso A, Mastromarino P, Masci A, d’Erme M, Mosca L. Chemistry, stability and bioavailability of resveratrol. Med Chem. 2014;10(3):237–245. Reis S, Neves AR, Lúcio M, Martins S, Lima JLC. Novel resveratrol nanodelivery systems based on lipid nanoparticles to enhance its oral bioavailability. Int J Nanomedicine. 2013;8:177–187. Lucas-Abellan C, Mercader-Ros MT, Zafrilla MP, Fortea MI, Gabaldon JA, Nunez-Delicado E. ORAC-fluorescein assay to determine the oxygen radical absorbance capacity of resveratrol complexed in cyclodextrins. J Agric Food Chem. 2008;56(6):2254–2259. Wegiel LA, Mauer LJ, Edgar KJ, Taylor LS. Crystallization of amorphous solid dispersions of resveratrol during preparation and storage-impact of different polymers. J Pharm Sci. 2013;102(1):171–184. Hung CF, Chen JK, Liao MH, Lo HM, Fang JY. Development and evaluation of emulsion-liposome blends for resveratrol delivery. J Nanosci Nanotech. 2006;6(9):2950–2958. Bu L, Gan LC, Guo XQ, et al. Trans-resveratrol loaded chitosan nanoparticles modified with biotin and avidin to target hepatic carcinoma. Int J Pharm. 2013;452(1–2):355–362.